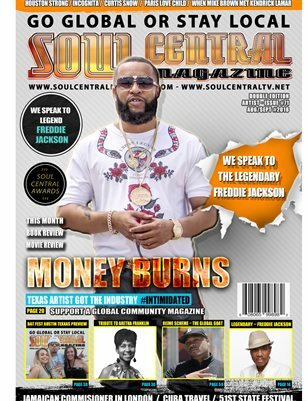 Soul Central Magazine #Edition #71 Indie Artist Money Burns"
This month we have another Double Edition with over 100 packed pages from our global community. Front Cover Talented Texas Indie Artist Money Burns, R&B Legend Freddie Jackson, UrUsha Pandey, Tribute to Aretha Franklin, Soul Central Awards, Debra Mitchell. Mike Brown, 51st State Festival, Alex Boye Suicide Prevention, Operation Underground Railroad, Kelly Clarkson, Reime Schemes,Youthful Secrets by Sarah Llc, Dr Dante Sears, Olympa Gellinio in Poland, Cali Fae Author, Laio Morris, Pastor Audie Cummings, Ngzozi Olivia Osuoha, Soul Central Token, Rated Awards, D DOUBLE E, Paris Love, Danger Man The community Hero, Suga T and much more.